Last night, I made vegetable pasta soup because I thought it would be nice to pack some healthy homemade soup for my munchkin’s school lunch. 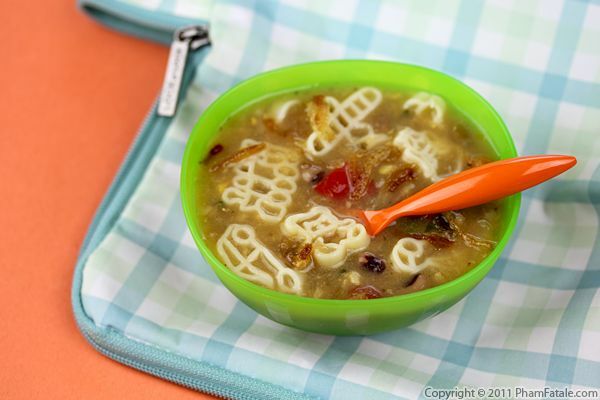 Pasta soup is satisfying, kid-friendly and super easy to make, and it keeps really well. I flavored the soup with fresh black eyed peas and added fun shaped pasta so it looked more playful. In the morning, I warmed up the soup and placed it in a thermos container that would keep the black eyed pea soup hot all the way until lunchtime. I placed a little note suggesting she ask her teacher to open the thermos when it was lunchtime, so she didn't get splashed with the hot contents. Feeding a vegetarian crowd isn't as difficult as it may seem. I usually pair a legume with rice, which is the perfect balance for a vegetarian diet. I've been getting fresh black-eyed peas (also known as "cow peas") at the local stand, and instead of serving them as a boring bean salad, I incorporated them in a rice dish, flavored with Indian spices. I've made this dish in the past; it's called "pulao". Our family loves the burnt rice at the bottom of the pot, called "kurchan". First, I sautéed black-eyed peas in onions, garlic, cider vinegar and red chili powder. They're very firm, so they take slightly longer to cook then the parboiled dried variety. I let them simmer until tender, then finished cooking them with steamed basmati rice and baby spinach. 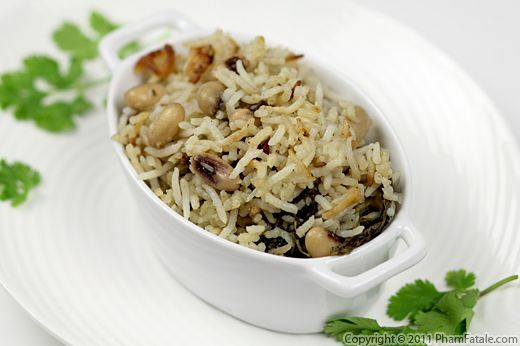 Rice and beans, in one form or another, are the staple nourishment of much of the world's population. We often eat Indian daal (lentils) and rice, which serves the same purpose of providing protein to the diet of the many vegetarians in our home. I'm always looking to add some variety to my family's diet, and I discovered a new dish on a recent trip to New Orléans. At least it was new to me. Black-eyed peas and rice is a very common dish in the American South. Prior to trying this dish, my only experience with black-eyed peas was in the Vietnamese dessert called chè đậu trắng. My husband likes black-eyed peas very much, so I made it for him using the same method for making Indian biryani, but with Southern ingredients.